I took 8,000 words of notes yesterday, the first day of the 2012 Lunar and Planetary Science Conference -- clearly I won't get to write about everything from this meeting; I'll have to pick and choose. 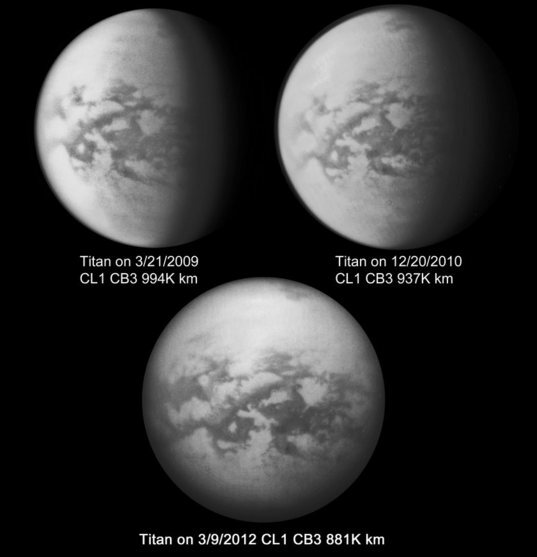 One of the topics I found most exciting yesterday was a series of talks on Titan's climate. 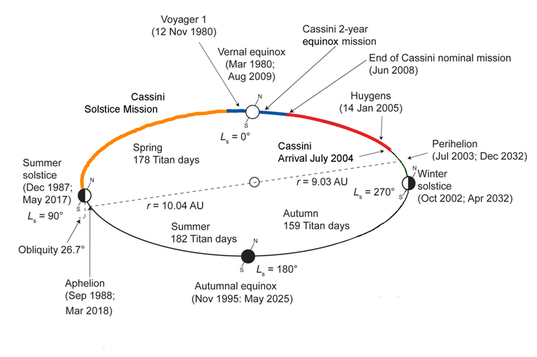 Cassini has been at Titan for nearly 8 years, and in that time it's seen the season change from southern hemisphere summer, through the equinox in 2009. The slow march of Saturn's seasons has brought major change to the weather across Titan. 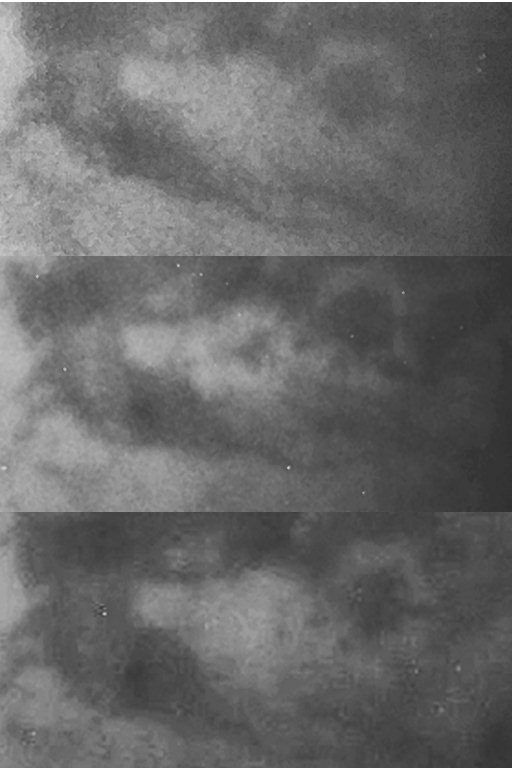 First, Bob West showed how Titan's detached haze has shifted with time. What's detached haze? If you look at global images of Titan, especially in short wavelengths, you see that the fuzzy globe is encircled by a fuzzy ring except at one pole, where the ring merges with the "polar hood." This ring is a photochemical haze. Ultraviolet rays from the Sun are ionizing gas molecules, particularly methane which recombine with each other, making longer-chain hydrocarbons. It only occurs at high altitudes because the ultraviolet light can't penetrate very deeply into the atmosphere. 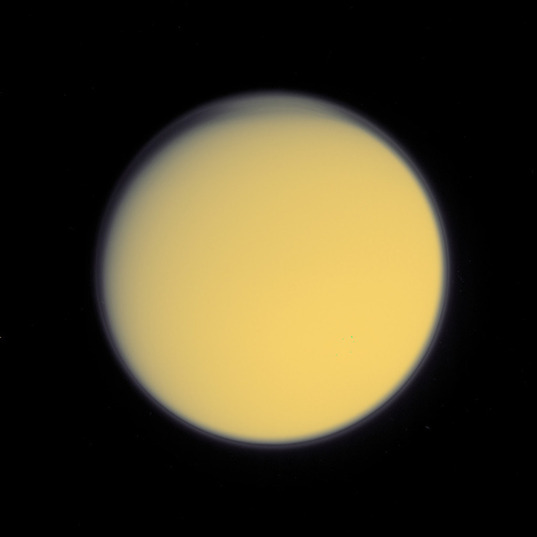 Titan's atmosphere is completely opaque in ultraviolet light. This image has been colorized to show the approximate true color of Titan. It was captured on October 24, 2004. Anyway, West said that when Cassini arrived, the photochemical haze peaked at an altitude of about 500 kilometers, which is very high -- Titan's diameter is 5150 kilometers. But as equinox approached, the haze dropped, and dropped very suddenly, bottoming out at 380 kilometers through and after equinox. Also, he noted that this altitude is identical to the altitude measured from Voyager 1 images -- which were taken exactly one Saturn year ago. Now, though, we're well after the equinox, and West showed some brand-new images of Titan that show that the detached haze has disappeared from Titan's south pole, and that Titan now has two polar hoods. This diagram shows the main events of Saturn's year, and where in the Saturnian year the Voyager 1 and Cassini missions occurred. Zibi Turtle presented about how Titan's weather has changed with these seasonal changes. Near the solstices, Titan's atmospheric circulation is very simple: air warms and rises at the summer pole, dessicating the landscape, and flows toward the winter pole, where it sinks, dumping methane rain to fill polar lakes under cover of winter darkness; it flows back to the summer pole across the surface. But near equinox, this situation has to reverse. What happens is you get an "intertropical convergence zone," much as on Earth, where that region of downwelling, wet air moves from the spring pole to the autumn pole, transitioning across the entire globe over time. At this particular time, with spring just arriving to the northern hemisphere, that downwelling region of air has shifted southward. So it's not surprising that the biggest outburst of cloud activity near Titan's equator happened just after the equinox. 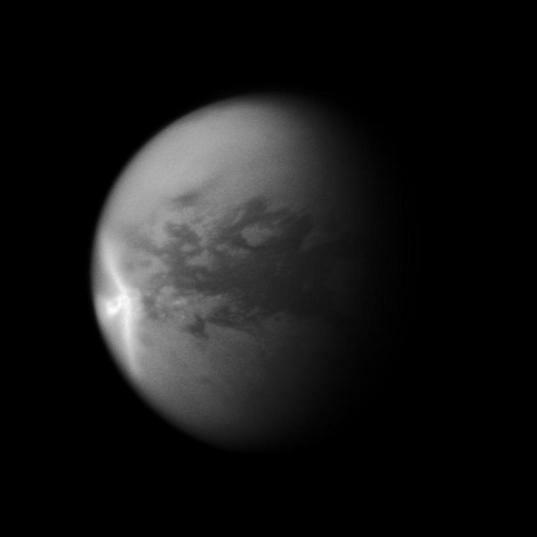 A huge arrow-shaped storm blows across the equatorial region of Titan in this Cassini photo. The photo was taken on September 27, 2010; that image was truncated in the south, so a small portion of the disk below the storm was filled in with an image from July 9, 2010. This storm created large effects in the form of dark -- likely wet -- areas on the surface of the moon, visible in later images. After this storm dissipated, Cassini observed significant changes on Titan's surface at the southern boundary of the dune field named Belet. Those changes covered an area of 500,000 square kilometers, or roughly the combined areas of Arizona and Utah. The part of the storm that is visible here measures 1,200 kilometers in length east-to-west. The wings of the storm that trail off to the northwest and southwest from the easternmost point of the storm are each 1,500 kilometers long. Excitingly, the outburst of clouds was accompanied by a darkening of the surface across 500,000 square kilometers of previously brighter terrain -- an observation that Zibi attributed to wetting of the surface. The darkening faded with time, as you would expect from a wetted region drying out. But the area that experienced the rainfall actually overshot its previous mark, brightening relative to its previous appearance. With the passage of more than a year, that brightening is proving to be transient, fading back to its original appearance. Jason Barnes followed up Zibi's talk -- which was based on Cassini camera images -- with a study of the same regions using data from Cassini's imaging spectrometer, trying to figure out what was going on with that brightening. It's not hydrocarbon "snow," Jason said, because the haze can't fall out fast enough. So that bright material must represent the delayed deposition on the rain-wetted areas of some substance that can either sublimate or blow away. Jason said that it could be just about anything that has fine enough grains to appear white to the imaging spectrometer, which sees at a wavelength range of 1 to 5 microns. He advanced a plausible hypothesis: the rain wets the surface, darkening it, and ponding in some places. Rain falling on the uplands runs off to valleys, where it can saturate the soil. Wind blowing across these saturated surfaces will evaporate, and evaporation causes cooling. It might just cause enough cooling for methane frost to form on the surface, brightening the places that were darkened previously. But, he said, this is only a hypothesis, and asked the community to come up with quantitative versions of this model, or laboratory tests. There was further discussion of rain on Titan today, in an interdisciplinary "planetary hydrology" session incorporating results from both Mars and Titan. Antoine Lucas showed evidence from Cassini RADAR images that there are "knickpoints" in Titan's polar rivers and terraces hidden beneath the waves of Titan's north polar seas that suggest that there have been recent changes in sea level beyond the cyclical, seasonal variation. Ralph Lorenz talked about rainfall rates on Titan. Actually, though, the best part of his talk was right up front, when he addressed the criticism that some people don't like the adjective "Earth-like" being applied to Titan. Titan's surface geology bears strong superficial similarities to Earth's despite the huge differences in composition and temperature. So, Ralph presented a different way of looking at it, in the context of this interdisciplinary session on hydrology on Mars and Titan: "Mars is the second most Titan-like world in the solar system." That particular session ended with a presentation by Jeff Moore, who challenged the room with a hypothesized Titan climate history that differs strongly from the situation that holds today. He called it the Triton-Titan-Mars hypothesis, and the central conceit was: what if Titan hasn't always had a thick atmosphere? What if it used to look like Triton (with all its volatile components locked in surface ices), and some relatively recent event -- the long-term brightening of the Sun, or a large impact -- suddenly triggered Titan's methane to sublime to gas? Geophysically, the results could be quite interesting. FIrst of all, you'd have massive global methane rainfall, carving valleys everywhere. So you'd suddenly have a global topographic gradient from equator to poles; all that rain, eroding bedrock and washing away sediment, would run from equator to poles, carrying sediment with it, depositing it in the polar depressions. As time went on and more and more of Titan's methane rained out, it would stop raining at the equator first, with Titan dessicating slowly from equator to pole. So you'd get highstanding, valley-carved mountains near the equator; badlands-style water-carved topography at midlatitudes; and sedimentary deposits and lakes in lowstanding poles. Another thing that would happen as the poles sank is that you'd see compressional tectonics -- faulted blocks rising -- and near the equator you'd see extensional tectonics -- pull-apart basins and mountain ranges. Like all of Jeff's stories, there are intriguing matches between this fairly simple scenario and some puzzling qualities of Titan. However, it's also an incredibly simplistic view of the geological history of a very complicated world, something that Jeff is very ready to admit. But Ralph Lorenz, who commented on the talk, agreed that it was an intriguing and probably correct point that climate change on Titan can change its tectonics (the processes that form mountains and basins). In general, I love the convivial nature of the arguments that happen among this particular community. So the Titan stuff has been very fun. There's already been so much more, though, from other icy worlds, and Mars of course. Sadly, nothing much from Venus; I poked my head into that session this morning to see the same people making only slightly different arguments than they had been making ten years ago. We need a new Venus mission. Venus, in fact, is another place where climate change may have had a direct effect on the nature of its geologic activity (and vice versa, of course). Maybe it's time for an interdisciplinary session on atmospheric forcing of planetary tectonics!